The Theatrical Trailer of I, the most anticipated film in a Shankar-Vikram collaboration and produced by Aascar Ravichandran, the Showman of Tamil Cinema, known for his grand approach, was released recently. Touted to be one of the biggest blockbusters to hit the cinema halls during Pongal, the movie's 2-minute trailer has already watched by over 27 lakh viewers on Youtube and is still trending. 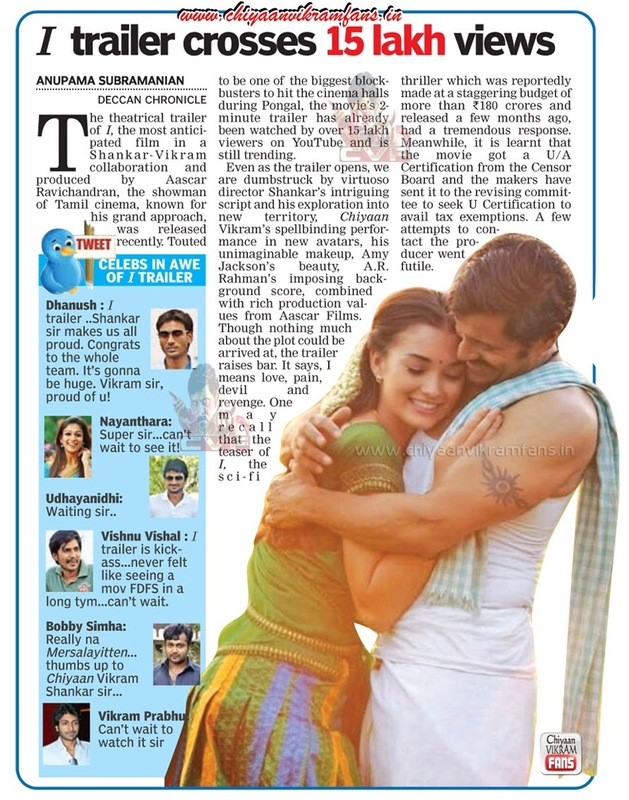 Even as the trailer opens we are dumbstuck by virtuoso director Shankar's intriguing script and his exploration into new territory, Chiyaan Vikram's Spellbinding performance in new avatars, his unimaginable makeup, Amy Jackson's beauty, A.R rahman's imposing background score, combined with rich production values from Aascar Films. Though nothing much about the plot could be arrived at, the trailer raises bar. It says, I means Love,Pain,Devil and Revenge. One may recall that the teaser of I, the sci-fic thriller which was reportedly made at a staggering budget of more that Rs 180 Crores and released a few month ago had a tremendous response. Meanwhile, it is learnt that the movie got a U/A Certification from the Censor Board and the makers have sent it to the revising committee to seek U Certification to avail tax exemptions. A few attempts to contact the producer went futile.